Tool of North America and Domani Studios have teamed up to release “Touching Stories“, four interactive stories designed for the iPad. By touching, shaking and turning your iPad, you can navigate, unlock and reveal unexpected variations in each of these stories. Four interactive, live-action short films, shot by five different directors, evolve storytelling in ways that haven’t been done before on the iPad. ‘All Ends, Ends All’, by directors Erich Joiner and Jason Zada, wakes users up in the back of a trunk with no idea how they got there. The interactive adventure challenges viewers / players to shake the iPad to run from guys shooting at them and dial numbers in an interactive phone booth. ‘Sarah and Jerry’, directed by Sean Ehringer, is a playful take on a few characters in a house. The twist is they have entered a zone where they are being controlled by the user – think The Truman Show, but you are the one pulling the strings. Touch the painting on the wall to hear what the portrait has to say, swipe left or right and see a dressed up mini horse. ‘The Most Interesting Couple in Britain’, directed by Geordie Stephens, shows a scene that plays out on a ‘local’ theatre stage featuring a married couple who have grown so comfortable and bored in their relationship they no longer have anything to say to each other. 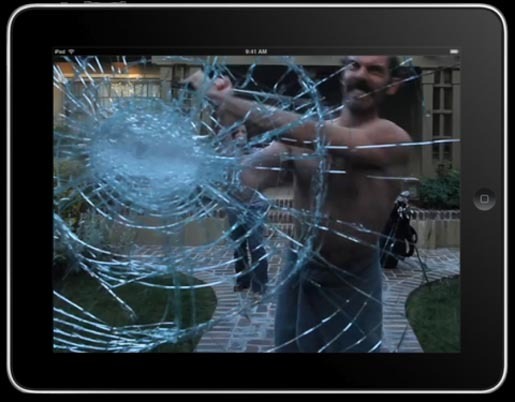 The iPad interactions include menu options where you can view the inner monologue of Stanley, Maureen and the dog. And check out the question marks which link to some unexpected and unusual web pages. ‘Triangle’, by director Tom Rouston, is set in a seedy hotel room, seen through the reflection on a television screen. Users are able to peel back layers of the story depending on how you interact with the film. Search out different elements in the motel room, such as the telephone and door placard to unlock hints, flashbacks and clues.